For traditional North-American music, see Old-time music. For the play by Harold Pinter, see Old Times. 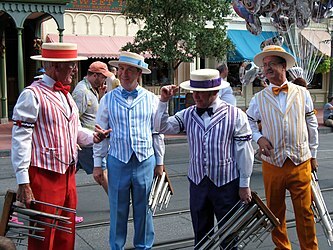 The Dapper Dans, a barbershop quartet at Walt Disney World, present Old Timeyness to park guests. "Old time" and "old timey" are terms used to describe stereotyped images and representations of the late 19th and early 20th centuries in the United States, generally not more than a generation before or after the start of the 20th century. The term "old timeyness" is used more rarely. All these terms may also be used in a more general sense, in which case, they are synonymous with "old fashioned" or "antique". Evocations of Victoriana (and Edwardiana) typically highlight class differences, featuring (for example) aristocrats and gentry who are dandified or eccentric, in contrast to working class and poor folk who are Dickensian or exaggeratedly rustic in their costume and manner. Old West themes differ from old timey themes in that they emphasize elements such as cowboys, firearms, horses, and drawled speech. However, aspects of Old West city or town life can overlap with old timeyness. The archetypical old timey costume (as seen in the Disney World illustration above) includes vertically-striped fabric, boaters, a vest, and sleeve garters of the type worn in the later half of the 19th century and still sometimes worn by poker dealers today. This clothing, often accessorized by a handlebar mustache and/or a certain style of dainty cane of bamboo or rattan with a curved handle, appears with some frequency in popular culture, especially in the cartoons and advertising mentioned below. Clothing with upper class associations, such as top hats, monocles and (to a lesser extent) spats, while entirely appropriate to the time period represented by old timeyness, are mostly excluded from the old timeyness discussed here. This highlights the distinction between the folksy associations of old timeyness and the sophisticated associations of fin de siècle. The Simpsons has made many references to things that are old timey, such as patent medicine, barbershop quartet and antique bicycles. Box socials have been mentioned more than once. Grandpa Simpson often includes old timey concepts in his rants. Mr. Burns often makes old timey references as well. The B-Sharps, a barbershop quartet featured in the episode "Homer's Barbershop Quartet" and referenced subsequently, dressed in stereotypical old time attire. Several episodes of Family Guy featured a stereotypical old time music duo known as Vern and Johnny. After being shot to death by Stewie Griffin in "Saving Private Brian" they reappeared as ghosts in "Back to the Woods". Conan O'Brien often referenced old timeyness on Late Night with Conan O'Brien, saying that he felt like he should be twirling his handlebar mustache, holding an oversized mug of root beer, etc. He also joked about wearing an old timey horizontally-striped bathing suit that covers everything above his shins and forearms. O'Brien's "Old Timey baseball sketch" has been talked about by other comedians. The Music Man (a play produced in the 1950s but taking place in 1912) is filled with old timeyness, including the main plot involving a marching band. For example, the song "Ya Got Trouble" contains such old timey references as medicinal wine, Dan Patch, knickerbockers, "tailor-mades" (i.e. factory-produced cigarettes), Sen-Sen, ragtime, Captain Billy's Whiz Bang (a magazine that actually began publication 1919) and the Spanish–American War slogan "Remember the Maine." The Beatles used old timey imagery during at least two periods in their career. They wore Edwardian jackets during their early period, such as when they appeared on The Ed Sullivan Show in 1964. Three years later, Sgt. Pepper's Lonely Hearts Club Band presented a flood of old timeyness ranging from vintage marching band uniforms to music hall-style song introductions. Paul McCartney has often returned to old timeyness in his post-Beatles career. One example is the music video for Say Say Say in which he and Michael Jackson pose as snake oil salesmen. Bubblegum music acts such as Edison Lighthouse, The Ohio Express and the 1910 Fruitgum Company regularly incorporated old timey, Victorian era or start of the 20th century themes into their acts. Stick candy, which dates back to the 19th century, is often marketed as an "old time" candy. Wendy's used old timeyness in its early brand marketing. Their logo still features start of the 20th century–style graphics and the phrase "Old Fashioned Hamburgers". The tables in most Wendy's restaurants are decorated with a pattern replicating advertisements from late 19th century newspapers. A&W Root Beer used a similar ad branding strategy in the 1970s, including the phrase "A&W old time root beer, yes sir!" Advertisements featured a man with a straw pork pie hat, handlebar mustache, and suspenders holding an oversized mug. More recently, A&W has begun marketing cream soda in old timey bottles. Ground Round also used old timeyness in advertising during the 1970s and 1980s, decorating its restaurants accordingly and providing free bowls of dry roasted peanuts for customers. Some locations had booths where patrons could view silent movies. ^  Gentleman's emporium, "sleeve garter"
^ "Old Timey baseball sketch" Note that although the footage is of an American Civil War-era baseball game, O'Brian adopts his standard "Old Timey" persona. It can be further noted that O'Brien's Old Timey start of the 20th century personal sometimes blends with his 1930s persona, especially in regards to ending many sentences with the phrase "ya see?" ^ Quote: "Old Time America of the Music Man"
This page was last edited on 8 November 2017, at 17:28 (UTC).